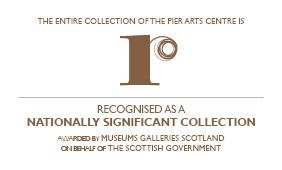 This summer Piergroup will be carrying out a short research project that will provide an interpretative insight into the Pier Arts Centre Collection and the temporary exhibition programme of work by Damien Hirst, Margaret Mellis, Edmund de Waal and David Ward. The project will explore what it means to be a collector and to categorise and display objects and collections. The group will be working with Rhona Warwick Paterson who has devised some creative and imaginative ways to encourage our thinking about the project and will help us formulate the bigger questions that we might address over the coming months. These sessions are designed to really kick start the project off – following this introduction, the project will be more spread out and flexible in how and when you are able to participate.